The parish of St. Mary of The Angels and St. Clare was founded in 1853, comprising districts of Levenshulme, Reddish, Heaton Norris, Withington, Barlow Moor, Longsight and Fallowfield. For over three hundred years, the Catholic Church had survived in hiding since the formation of the Church of England during the reign of King Henry VIII. The Diocese of Salford and other Catholic dioceses were established in the 1850s around the country as from then Roman Catholics were legally allowed to practice their faith and play a part in public life and even being granted the right to vote. On March 25th 1856, Samuel Grimshaw Esq. who was a native of Levenshulme and lived at Errwood Hall near Buxton Derbyshire, donated 7820 square yards of land together with an annual endowment of £25 to the parish of St. Mary’s in Levenshulme in Manchester. A community of Good Shepherd Sisters took up residence and were then succeeded by Cross and Passion Sisters. Father Thomas Unsworth became the first Parish priest of St. Mary. He left in 1855 to become an army chaplain during the Crimean War. Succeeding him was Father Henry Fox, who moved on in 1862 to establish the parish of St. Edwards in Rusholme as the Diocese of Salford began to develop its parishes. On 26th May 1871, during the rectorship of Mgr. 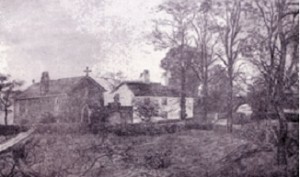 Croskell, eight Belgian Poor Clare Sisters settled in Levenshulme. Their monastery was built on the cross roads of Errwood Road and Nunnery Lanein Levenshulme. 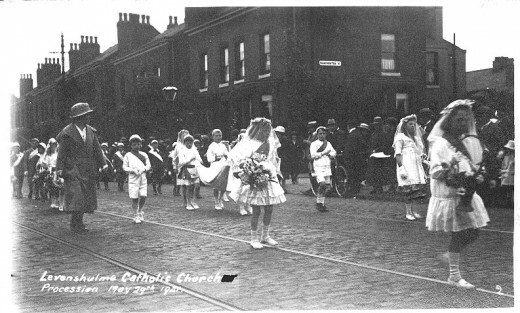 Nunnery Lane was later renamed as Clare Road after their foundation and is now the site of St Marys primary school. Bishop Herbert Vaughan, later to become Cardinal Archbishop ofWestminster, laid the foundation stone of the church on 15th July 1882. The church was opened on the 4th March 1883 but was found to be too small for the quickly growing parish, and so an extension was built which opened on the 1st November 1914 by Bishop Casertelli. In 1898 a purpose built school was erected to replace the day and evening schools in existence since the foundation of the parish. The building was built on the same site as the church and Poor Clares and consisted of three classrooms and a hall. With Miss Agnes Holt as its headmaster and Miss Eleanor Holt as her assistant the school opened on the 10th October 1898. Forty four children attended morning lessons and forty seven the afternoon lessons. Over the years the number of children attending school grew, and so a temporary structure was erected in 1914 to cope with the expanding number. In 1940, Monsignor Joseph Masterson, Vicar General of the Diocese of Salford, became Parish Priest. In 1947 Mgr. Masterson was appointed the Archbishop of Birmingham. In the later part of the 1950’s it became apparent that even the extended church on Clare Road was too small for the growing congregation. Father Leonard Hulme, Parish Priest from 1956, on behalf of the parish bought the Grand Cinema on Stockport Road in 1957 at a cost of £8500. Mr. Edward Blackwell was the architect in the conversion from cinema to church and later designed the statue of ‘Our Lady of the Angels’ which now resides above the main entrance to our present church. The old church and presbytery were now free to be used as hall, library, head office and staff room. The newly converted church was blessed by Bishop Beck who celebrated the first Mass there on 14th August 1957. In 1957, approval was also granted for the construction of a new school, phase one being opened on 1st May 1961, phase two was completed in 1970 and phase three in 1973. School attendance reached 499 children in 1972. Permission was also granted in 1972 for the construction of a new church on the same site as the old cinema. Its architect was to be Mr. Tadeusz Lesisz. The new church was officially opened during Midnight Mass Christmas 1975. The church was consecrated by Bishop Holland on 25th May 1983. On 31st August 1978, the Poor Clare Sisters who had been such a prayerful presence in the parish and community for so many decades, left Levenshulme. The old church and convent were demolished in 1980 into which the school grounds have now been extended, with the ground being recently landscaped and new gardens created with the help and efforts of parents, pupils and friends. All over the Christian world, at the dawn of the new millennium, began celebrations for the Jubilee year of the birth of Jesus Christ. St. Mary of the Angels and St.Clare took an active part in these celebrations. On 8th December 2000 we celebrated the 25th anniversary of the new church being opened. The Mass was well attended by parishioners of St. Mary’s with Bishop Terence Brain of the Salford diocese and many priests from surrounding parishes also in attendance, making for a wonderful day to remember. Parishioners of St. Mary’s turned their attentions to the year 2003, which of course was the 150th year anniversary of the establishment of the parish of St. Mary of the Angels and St. Clare. With the commitment that the local community have demonstrated the anniversary was celebrated with much enthusiasm and pride. It will be the task of future generations to write the history of the years of the future. The story from 1853 has been the tale of not just of bricks and mortar but of a community expanding to face the challenges of being a disciple of the living Lord in every age.